It's almost Girl Scout Cookie Season in our area!! 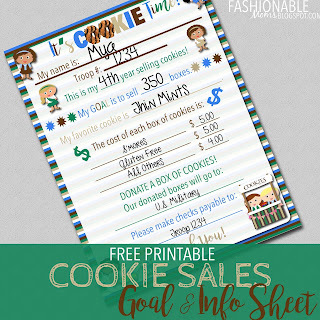 I wanted to share this free printable goal & info sheet with you! It would be great to have your Girl Scout fill out, laminate, and keep with her order form when she's out selling! CLICK HERE TO DOWNLOAD! In order to keep these printables FREE, I do not offer customization. However, please visit my Etsy shop for customization inquiries! Created for your personal use by Jamie myfashionabledesigns.com. Professional printing allowed. Thank you for this sales goal poster! The girls really loved having this and we were able to come up with a troop goal and individual goals.